The Peggy and Jack Baskin Foundation Presidential Chair for Feminist Studies and The Humanities Institute at UC Santa Cruz will present Always Moving Uphill: Women in the Arts, on Tuesday, May 29, at Kuumbwa Jazz Center in downtown Santa Cruz. UCSC feminist studies professor Bettina Aptheker will moderate an evening panel beginning at 7 p.m., featuring poet Robin Coste Lewis, National Book Award winner for Voyage of the Sable Venus; emeritus UCSC music professor Nicole Paiement, artistic director of San Francisco’s Opera Parallèle; opera composer Laura Kaminsky; and UCSC history of art and visual culture professor Jennifer Gonzalez. The panelists will discuss the historic and continuing discrimination against women in all artistic fields--including music, theater, film, fine arts, and literature. The event is free and open to the public, but registration is required. 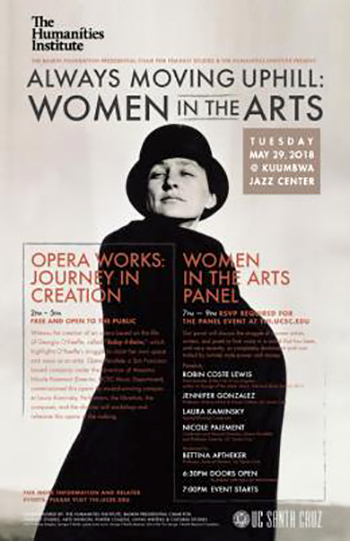 Earlier that afternoon at Kuumbwa, the public will have the opportunity to attend a free workshop rehearsal with Opera Parallèle for a new opera, “Today it Rains,” based on the life of artist Georgia O’Keeffe. Paiement commissioned award-winning composer Laura Kaminsky to create this original opera for Opera Parallèle, and it is currently a work-in-progress. The singers, musicians, composer Kaminsky, librettist Mark Campbell, director Brian Staufenbiel (former director of the UCSC opera program), and co-librettist and videographer Kimberly Reed (whose recent transgender film is called Prodigal Son) will all be in residence at Kuumbwa to workshop and rehearse the new work. The workshop will take place from 2 to 5 p.m., and is open to everyone. Panelist Robin Coste Lewis will also give a public reading at Bookshop Santa Cruz on May 30 at 7 p.m. She will additionally appear as part of the Literature Department’s Living Writers Series on May 31, at 5 p.m., in the Humanities Lecture Hall at UC Santa Cruz. Currently the poet laureate of Los Angeles, her work has appeared in numerous journals and anthologies, including The Massachusetts Review, Callaloo, The Harvard Gay & Lesbian Review, Transition, and VIDA. Always Moving Uphill: Women in the Arts is co-sponsored by the Arts Division, Porter College, Living Writers & Cultural Studies. Click here to register for free admission to the evening panel at Kuumbwa. Information about a related event in the Arts Division, “Opera Day,” can be found on the UCSC events calendar. For more information, contact The Humanities Institute at thi@ucsc.edu or (831) 459-1274.